ROD AV: 2.3 fish per man. 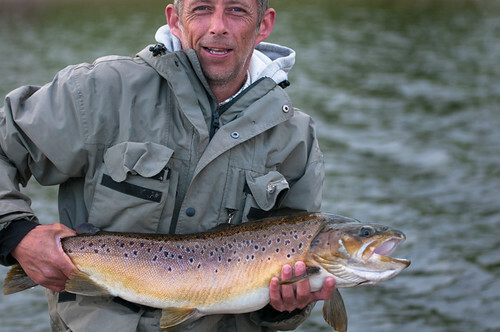 Sport: Once again the average size of fish caught this week has been exceptional at 3lbs 2oz. No one quite managed to complete the McNab but a few have been close. Vince Williams had a lovely bag of trout on Saturday. His catch included two rainbows one at 3lbs and one at 4lbs, a brownie of 5lbs and a tiger trout 2lbs 8oz. He just needed a blue but he only had the morning and eventually the time got the better of him. Vince fished a mini cats lure ultra-slowly on a floating line. Mr J K Lowrie also came close. His bag included a 6lb rainbow, 3lb 8oz brownie and small blue trout of 1lb 12oz. he just couldn’t find the tiger. His best fly was an Invicta. This entry was posted in Bank House Fishing Reports on November 28, 2011 by Ben Dobson. NOTABLE CATCH: Ian Greenwood and Mark Tyndall 6 fish to the boat, Tony Taylor 4 fish, Jeff Beamer 5 fish on the worm. Both the bank and the boat are producing bags of fish. Boobies and Di3 lies are taking the fair share, so too are the anglers opting to fish the worm. Tony Taylor has had 2 visits this week and has landed fish both days. Fishing his own booby patterns in an olive colour Tony has found all his fish from Bell point. On his last visit this week he managed 4 good fish weighing in at 9lb. Jeff Beamer landed 5 fish on worm and float. Jeff found the fish wanted the bait at about 8ft down fished around the willows. The season finishes next Wednesday and while the weather is still mild the fishing is going remarkably well. This entry was posted in Stocks Reservoir Fishing Reports on November 24, 2011 by Ben Dobson. NOTABLE CATCH: 11 trout for Mr D Ashburn from Egremont and 10 trout for David Harrison. BEST BROWN: 4lbs 14oz Tom Prescott from Ormskirk and 4lbs 8oz Phil Bisgrove from Morecambe. ROD AV: 3.93 fish per man. Sport: Bank House has continued to fish really well. The methods are mixed at the moment with the best catches split between lures and buzzers. The stamp of trout being caught is excellent; the average weight of each trout caught this week was 2lbs 12oz. Mr D Ashburn from Egremont switched between blobs, buzzers and egg flies to take 11 trout and David Harrison took 10 fish on buzzers fished under the bung. Several other anglers landed 9 trout but two worth a mention were Mr W G Newman from Blackburn and Mr B Kay from Blackpool. Mr Newman’s nine fish haul included a cracking 5lb 8oz rainbow and his best pattern was the trusty old cat’s whisker. Mr Kay was the only angler of the week to catch the Bank House McNab (catching a rainbow, a blue and brownie on the same day) he used a green lure but also found success with orange. During this coming week we will be stocking some lovely tiger trout so the McNab will include four trout types. I can say that all four types of trout will be present in number. Can anyone catch all four in one day? This entry was posted in Bank House Fishing Reports on November 21, 2011 by Ben Dobson. BANK ROD AV: 2.0 fish per man. BOAT ROD AV: 4.5 fish per man. Sport: Today out on the boats we had father and son team Steve and Thomas Hacking, the team had a great half day session with 9 fish to the boat. The pair opted to fish worm taking advantage of the any method we are holding this month. They fished around both Gull and Willow Island choosing to float fish their worms varying the depth though out the day. On the bank we had Michael Taylor, who landed a number of fish around Bell Point fishing orange boobies on a sinking line. Another angler on the bank today was Tony Taylor who had 5 fish from around Bell point. Tony fished with a streamer tip line and Dawson’s Olive boobies, and commented that the fish where taking the top dropper almost strait away. This entry was posted in Stocks Reservoir Fishing Reports on November 20, 2011 by Ben Dobson. BANK ROD AV: 1.0 fish per man. BOAT ROD AV: 1.8 fish per man. Sport: Today at Stocks we held the 2011 Stocks and Shares, with 15 anglers fishing that gave a £300 pot. The majority of the anglers opted to fish from the boats with only one choosing to fish on the bank. Taking the 2011 Stocks and Shares crown was Bob Fitzpatrick who fished around the back of Willow Island using a Di-3 line and boobies. Bob had a black pearly cormorant booby on the top dropper and a cat’s booby on the point, and used a very slow roly-poly to get the takes all day. With the 5 Rainbow’s Bob weighted in that gave him a £115 pound share of the pot, as well as a Vision Atom jacket worth £90, he also returned 2 Browns. In Second place was Jim Pickford who landed two Rainbows giving him a £46 pound share of the Pot. Another angler who did very well today was John Hood who landed 6 fish unfortunately for John 5 of those fish where Browns so he only could weight in one fish which was worth £23 pounds of the pot. This entry was posted in Stocks Reservoir Fishing Reports on November 19, 2011 by Ben Dobson.